STANDING TALL Senior Katie Dutchman and freshman Symone Abbott go up a block. The pair combined for 22 kills against the Badgers, which was almost half of the Wildcats’ 45. 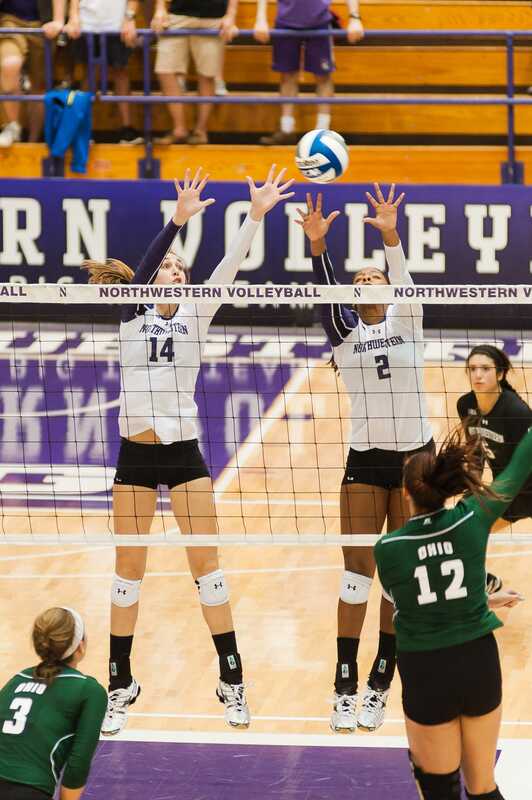 Northwestern (12-2, Big Ten 2-1) got off to a strong start against No. 6 Wisconsin (11-2, Big Ten 2-1) but was unable to come away with the upset Wednesday. The Wildcats showed that they were able to compete with the Badgers in two of the three sets but could not maintain consistency throughout the match. NU fell to Wisconsin in three sets (20-25, 16-25, 23-25). As anticipated, the Wildcats and the Badgers came out ready to play on Wednesday. Although Wisconsin is the sixth-ranked squad in the nation, these teams were evenly matched early on. The Wildcats got off to another fast start but the Badgers quickly overcame a four-point deficit. Each team tried to gain control early on in the first set but neither would budge. The momentum swung multiple times before the Badgers opened their own four-point lead late in the set. “I was nervous before the game started but once you start playing you just feel like everyone else,” freshman Symone Abbott said. NU could not slow down the Wisconsin attack, allowing the Badgers to hit at a staggering .481 hitting percentage. The balanced Badger offense had four players with at least three kills, including four kills from freshmen Kelli Bates who finished with 13. The Wildcat offense was able to match the Badgers with 14 kills, four of which came from Abbott, but a low .312 hitting percentage was not enough to keep pace with Wisconsin. It was the NU defense that led to the loss of the first set 20-25. “Symone Abbott was unbelievable, she had some freshmen moments but she is going to be special,” Chan said. NU would struggle in the second set falling behind 6-17 before Chan could call timeout to stop the bleeding. Wisconsin’s back line made several unbelievable digs, preventing the Cats from getting into a groove offensively. The Wildcats played on their heels most of the set as Wisconsin applied pressure by controlling ball possession. Freshman Taylor Tashima helped the Cats decrease the Badger lead but did not prevent Wisconsin from having its way. Their defense tightened, stifling the NU attack and holding them to a .079 hitting percentage. The Wildcats dropped the second set 16-25. The Cats did not go quietly in the final set. NU reestablished its poise by getting back to the way it has played all season. Dutchman re-energized the crowd with a much needed kill to tie the set at 11. Seemingly unfazed, the Badgers came right back with another five-point run. However, the Cats continued to fight, not allowing Wisconsin to run away with the match. NU put together an impressive stretch of six unanswered points, pulling within one before the Badgers closed the window of hope by winning the set 23-25. Although the Wildcats did not win the match, there were plenty of positive takeaways that the team will be able to use going forward. NU will not have time to dwell on the loss but will need to use this match as motivation heading into a difficult stretch in their Big Ten schedule. It will take better play and more effort from the Cats if they wish to contend against the elite teams in the Big Ten. Northwestern will not get the opportunity to face Wisconsin again during the regular season. The Wildcats turn their attention to No. 18 Minnesota, who comes to Welsh-Ryan Arena on Sunday.